There aren't many things in life better than chocolate chip cookies. That's not an opinion, that's a fact. 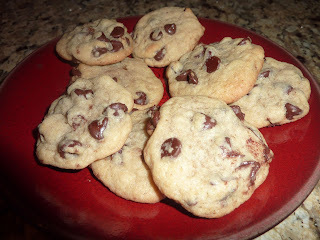 What is an opinion, however, is what recipe makes the best chocolate chip cookies. Here at the Food Driven Life, I am an equal opportunity chocolate-chip-cookie recipe employer. There is no BEST recipe, because everyone likes a different cookie. I like chewy, some like cake-y, some like dense, and some like Famous Amos. With the exception of the latter, all cookie lovers are welcome here. This is a darn good chocolate chip cookie recipe, if you're into the Chewy. Did you know what bread flour does to cookies? Great things. Amazing things. Try it, you'll like it. Preheat the oven to 350. In the bowl of a standing mixer, cream together the shortening and sugars until light and fluffy. Beat the eggs in, one at a time. Add the vanilla, then the milk (you may not need 2 full tablespoons...you just don't want the dough to be really dry).